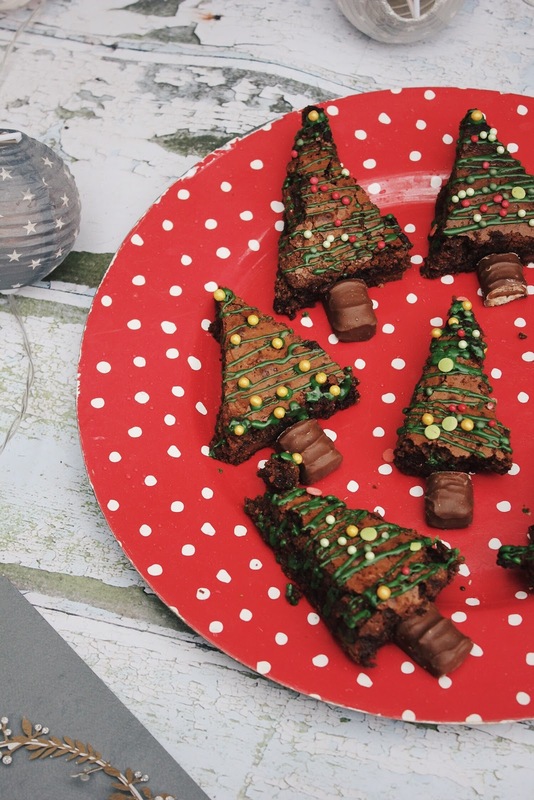 Salted Caramel Christmas Tree Brownies Recipe! 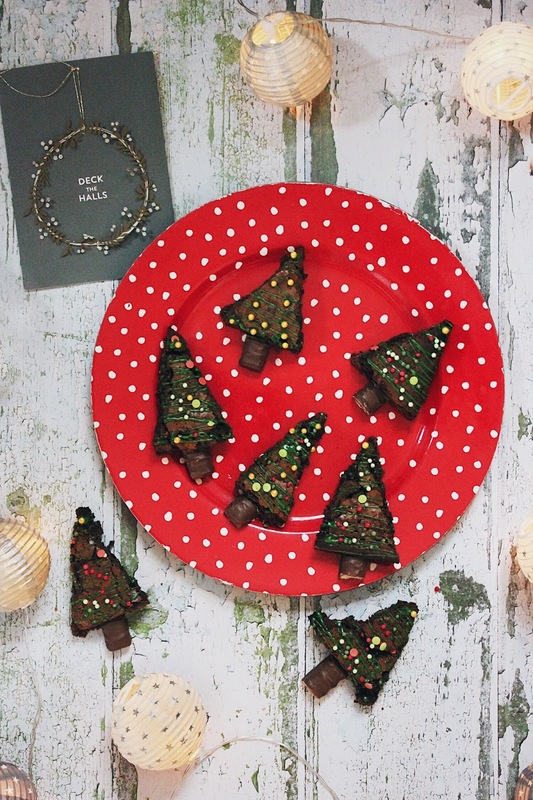 Salted caramel, chocolate and Christmas what more could you possibly want in December? Inspired by Pinterest and a wonderful post I saw on Liv's blog I've created this delicious salted caramel Christmas tree brownies recipe. At my work we're each bringing in Christmas snacks every other day, so this would be perfect if you're doing something like that or if you have your're having your very own friendmas. They're super naughty and definitely very bad for you but I do think that this is what Christmas is all about. I think we should embrace being a little more like Nigella Lawson having a midnight snack at Christmas, I really hope you get the reference (if not watch this)! Heat your oven to 170 degrees. Line a square baking tin, with grease proof paper. Place the dark chocolate and butter in a large bowl set over a pan of simmering water (make sure the bottom of the bowl doesn't touch the water) and leave until just melted. Take off the heat and use a whisk to add in the sugar, then the eggs, then the vanilla extract and half the salt. Slowly sift in the flour and then stir together using the whisk. Pour the mixture into the tin, spreading it out so that it is even as it can be and then press a piece of caramel chocolate into the mix. Then sprinkle over the remaining salt. Bake in the oven for 20-25 minutes, or until a skewer inserted in an area with no caramel comes out clean. The brownies should also be starting to come away from the edges, and gently cracking on top and leave to cool. Whilst they are cooling make your green icing. Add half a tea spoon of water to your sugar and add a little bit of food colouring (I use gels) and mix together. If the icing is too runny add more icing sugar until it has a consistency a bit like cream. As my green food colouring I used some black colouring to darken the colour. Cut your brownies into triangles and place then on a baking tray. Add your green icing into a piping bag (or you could use a spoon) and drizzle the icing over your brownies. Whilst the icing is still wet sprinkle over some decorations, these will be the baubles on your Christmas trees. 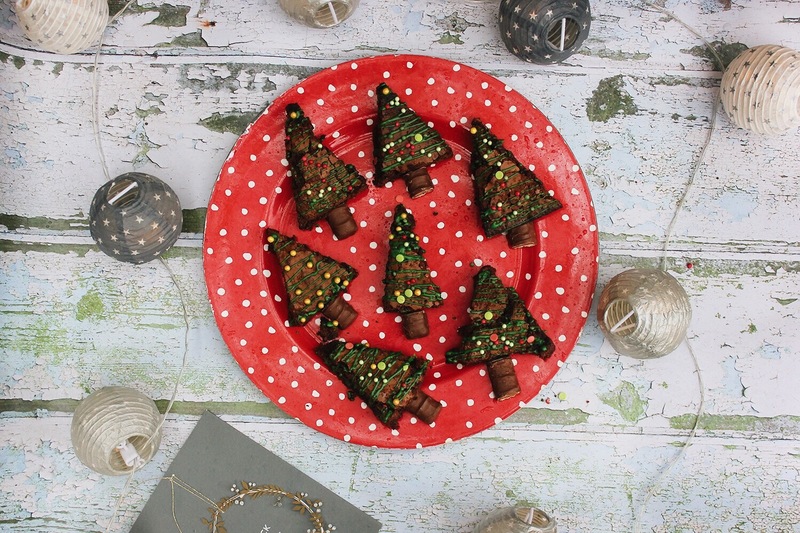 Finally shop up your bars of twix and push these into the bottom of the brownies, these will the trunks of the tree. I have to be honest, I had a total nightmare whilst putting this blog post together. To begin with I put the oven on the wrong setting, then I realised I had the wrong chocolate, once the brownies were ready it was too dark to take photos inside but then when I popped outside it started to rain. So please do not think blogging is effortless or quick, because it totally isn't! Anyway, they tasted absolutely amazing and I was thrilled about the end results, it's just a shamed the photography didn't turn out the way I wanted it to! It looks just too yummy !